This is Part 3 of a 3-part series about creating a work or study space according to your learning style. Part 1 was about designing an optimal working environment for visual learners and Part 2 was about creating a study space for auditory learners. 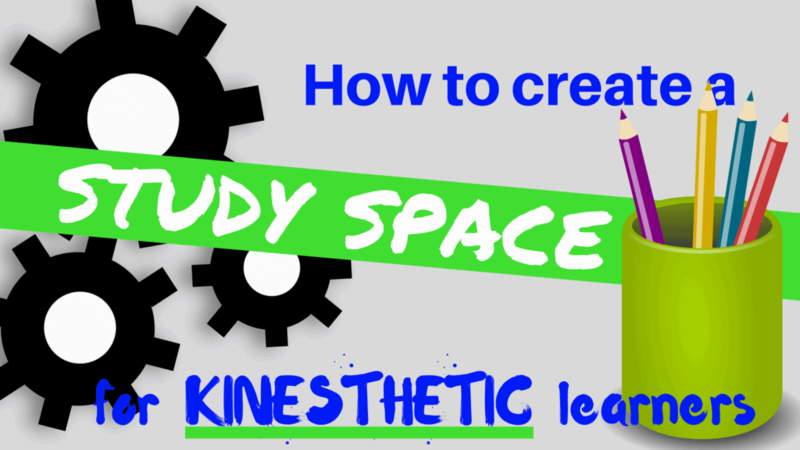 This final post focuses on how to create a study space for kinesthetic learners. As I’ve said in the other posts in this series, it’s critical to understand your unique learner profile — in other words, what type of learner you are. Here’s some science behind learning-style theory if you like that type of thing. If you’re a kinesthetic learner, you should set up your work or study environment in a way that allows you to move around and interact with your material. Below are some suggestions that could make a big difference in how well you study. Also, when you’re done setting up your study space, here are 3 study tips for kinesthetic learners! 1. Keep a clock or timer on your desk. Kinesthetic learners benefit from studying in frequently spaced, short intervals — so keeping a clock or timer visible will remind you to stop and take a break after about 30 minutes or so. If you sit for much longer than that, your retention rate drops and you’re essentially wasting your time. Try the Pomodoro Technique, which I explain here. It works so awesomely for active learners. 2. Keep your materials portable. Because kinesthetic learners benefit from periodically switching up their study environments, I recommend using a laptop instead of a desktop (I know this isn’t possible for everyone) so you can pick up and head to a bookstore or library to study once in awhile. Also helpful is a set of headphones so you can listen to the audiobook version of whatever you’re supposed to be reading while moving around. Lastly, keep your papers, folders and other materials under control (come on, you don’t need half of the crap you carry around in your bag!) so it’s easy to grab your stuff and go somewhere. 3. Create a study space with enough space to move around. Kinesthetic learners and sitting do not mix well. So be sure to work or study in a room that has enough space in it for you to pace around. Doesn’t matter if you walk in circles or do squats while you’re practicing your Spanish words or reciting your presentation. Just move. 4. Use a standing desk or prop up your computer. I want a standing desk so badly! But they’re so darn expensive that I just can’t justify it. If you have the means to get a standing desk, I definitely recommend it. If not, you can simply put your laptop on top of a box or stool on top of your desk or table. That way it’s high enough for you to stand while typing, reading or studying. Standing is not only better for everyone, but it’s especially great for kinesthetic learners. 5. Get a white board. First of all, who doesn’t love to doodle on a white board?! Second of all, standing up to map or draw something out on a whiteboard can help kinesthetic learners engage with the material … and that’s the key to learning it! Draw out timelines, images, Venn diagrams, etc. Just work with the material in some manner and you’ll have a better shot at remembering it long-term. Pick a chair that makes your body happy! This is my real home-office, and you can see that I have two chairs — both allow me to move around. 6. Use a chair that makes your body happy. For kinesthetic learners (and for humans in general! ), a happy body is a happy mind. So invest in a chair that makes your body happy, whether it’s a swivel chair, a reclining chair, a stability ball (my personal favorite), a giant bean bag, or whatever. If you must sit, then do so in a way that still allows your body to move around and shift positions (or bounce!). Just as we dress ourselves in clothes that fit us and make us feel confident, and just as we eat foods that taste good to us and make us feel good, we should also design our environments to support us and make us feel capable. That’s why knowing how to create a study space for kinesthetic learners is the first step in setting yourself up for a killer study session.